There’s no handbook for how to manage the Pe Ell River Run. 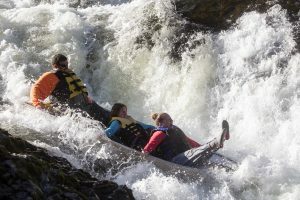 This informal splash of an event traces back to a group of friends who decided floating from the West Lewis County town of Pe Ell downriver to Rainbow Falls State Park sounded like a good time. Now, hundreds make the journey each year, utilizing everything from rafts and inflatables to canoes and kayaks. You’ll have to do some research online to find the best starting points in Pe Ell, but make plans to enjoy Rainbow Falls State Park upon your soaked arrival. Celebrate the agricultural roots of Southwest Washington at the Spring Youth Fair, the younger sibling of the Southwest Washington Fair. 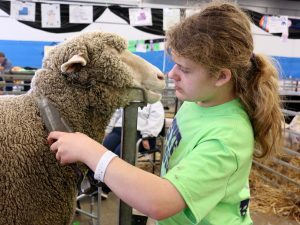 The event has all the features of a full-fledged fair — a carnival, food, vendors, live music — with a focus on area youth, their livestock, their collections and their passions. The youth fair is open 5 p.m. to 10 p.m. Friday, 10 a.m. to 10 p.m. Saturday and 10 a.m. to 5 p.m. Sunday. The cost is $5 for the weekend or a day for adults. Kids 6-12, seniors, and military members can pay $4 a day. Children 5 and under are free. Lewis County’s smallest municipality throws a huge party to celebrate May Day each year. The Vader May Day Festival includes all the staples of small town revelry with local accents that simply cannot be found anywhere else. Take Highway 506 off of Interstate 5 and venture toward the town on May 7. If you make it by 11 a.m., you’ll be able to take in the parade. After that, stick around for a carnival, tours of the town’s historic locations — including the old city jail — a community garage sale, horseback rides and more. What festival would you imagine occurs in a town built on the poultry industry that is home to the World’s Largest Egg? Yes, Winlock Egg Days are the celebratory embodiment of this friendly South Lewis County town. People flock from all around to attend the parade and events that last throughout the weekend. It all starts with the coronation of the Egg Day Queen on Friday. 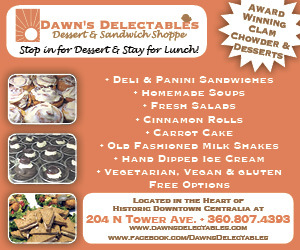 Attendees will find plenty to offer in the shops, restaurants and other businesses that function within Winlock’s downtown area. The festival also includes games, crafts, food, live music and an opportunity to tour such beloved local establishments as the Winlock Historical Museum. Of course, there are plenty of egg salad sandwiches to go around. Naturally. For the uninitiated, it’s a car show unlike any other. Billetproof isn’t hung up on classifications or specific models of vehicles. 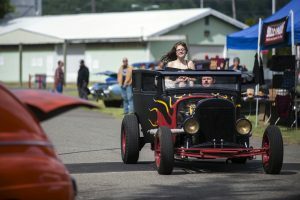 In fact, it’s billed as the “World’s Least Important Car Show.” You’ll see four-wheeled marvels unlike any other at this immensely popular event that spill over into the Centralia and Chehalis from its headquarters at the Southwest Washington Fairgrounds. Spectator entrance opens at 9 a.m. The cost is $10 for most spectators, but admission is free for children under 13 and members of law enforcement or emergency response organizations. The event includes a cruise through Downtown Centralia for participants, a pinstripe panel jam, live music, vendors and a swap meet. As far as events and festivals in Southwest Washington, Summerfest sits near the top in terms of size, scope and importance to people in the greater Centralia area. It’s an all-day extravaganza that begins with food, games, live music and demonstrations in Fort Borst Park and ends with a stunning fireworks display at the Southwest Washington Fairgrounds. All in all, it’s the quintessential celebration of freedom and independence for residents of Lewis County who carry decades-old memories of attending the affairs with their parents and later initiating their own children. Morning offerings include a free pancake breakfast, the I Ran From the Cops run/walk and more at Fort Borst Park. After a 4 p.m. parade, revelers head to the fairgrounds for a demolition derby and other festivities. Don’t miss out on tours at the Fort Borst homestead along the Chehalis River. Check the city of Centralia’s website for details as you plan for an Independence Day you won’t soon forget. The city of Toledo is a beautiful, rural town on the road to improvement. The spirit of transformation can be found most potently in its annual Cheese Days celebration. Spearheaded by the Toledo Lions Club, the extravaganza lasts a full weekend and functions as a celebration of the dairy industry and the cheese it produces. There’s a car show from 7 a.m. to 5 p.m. on Saturday. Breakfast is provided at the senior center before the town comes together for a parade at 11 a.m. After the floats are finished, choose between a silent auction, a kids carnival, raffles, wine, beer and cheese tasting, a barbecue, a horseshoe tournament and more. The Lions Club provides free cheese sandwiches for those looking for a meal themed to the occasion. The Washington Acoustic Music Association has chosen the Egg City as the location of this annual festival that celebrates bluegrass-themed music. Amateurs and professionals alike take the stage at Winolequa Park for two days of laid-back entertainment. Camping is available at the site, which also plays host to activities for children, open microphone sessions and instructional workshops. July 16-17, 9:15 a.m. to 7 p.m. Many of the small towns in Western Washington celebrate their roots with festivals. In Napavine, it’s all about fun. The Funtime Festival includes a car show, lawnmower races and of course a parade. Most of the festivities are centered around Saturday, but stick around for the car show on Sunday. 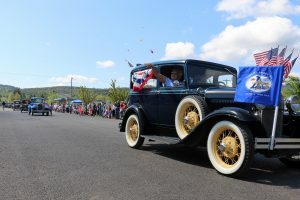 Venture off of U.S. Highway 12 and drive straight into the heart of Mossyrock for a celebration of this East Lewis County town and its agricultural history. The Blueberry Festival is held annually the first week of August. It features vendors, live music, activities for children and, of course, all things blueberry. It’s organized by the Mossyrock Action League, which sees to it that every event is enjoyable to both locals and wayward travelers looking to sample the local scene (and, again, blueberries). The latter name better encapsulates the sheer size and scope of the event, which stretches over four days and attracts thousands of people interested in seeing who is the very best at their trade. This year will mark the 74th jubilee in Morton, and it promises to be just as enjoyable as its predecessors. Choker-setting, log-rolling, axe-throwing and speed climbing are just a few of the heart-stopping competitions scheduled to occur in the friendly, rural logging town of Morton off of U.S. Highway 12. That’s not even mentioning all the opportunities and revelry throughout the town during the weekend. Lawnmower races, a parade, and a 10K run round out the offerings on a weekend that largely unites the East Lewis County town and draws in thousands of visitors. As the event draws closer, learn more online. Hosted in Toledo, this festival provides another opportunity for visitors and residents to take in some sweet, twangy bluegrass music. For specific information on lineups as the event draws closer, check the Washington Bluegrass Association website. The old tools and machines of agriculture are the focus of this annual South Lewis County festival. Attendees are treated to an up-close look at tractors, threshers and other farming equipment in a setting filled with all the usual festival favorites. 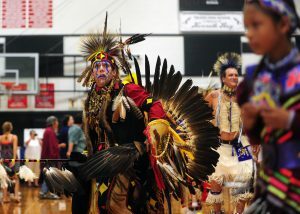 J.C. Allen-Tackett, Silverdale, dances during an intertribal dance at the Cowlitz Indian Tribe’s 14th Annual Pow-Wow at Toledo High School on Saturday afternoon. Sept. 17, 1 to 10 p.m.
Before white settlers arrived in what is now Southwest Washington, the land was occupied, utilized and cared for by American Indians. Each year, the public is invited to the Cowlitz Powwow to honor and preserve the traditions, customs and history of Native Americans. 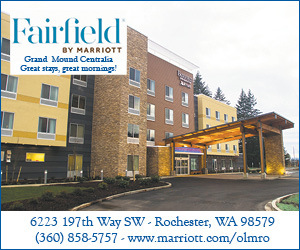 It features a grand entry at 1 p.m. and 7 p.m. with a dinner of salmon being served at 5 p.m. The Pow Wow, in its 17th year, will feature Tanna Chattin-Engdahl as Head Woman Dancer, Mark Sison as Head Man Dancer, and The Allen Family Singers as Host Drum. Be a part of local history by taking part in the first Fat Tire Ride and Festival along the Willapa Trail, which stretches from rural Chehalis to Pe Ell and beyond. The aim is to showcase the beauty of the valleys that host the trail and highlight the farms along the way. Cyclists will depart from the Veterans Memorial Museum at 100 SW Veterans Way, Chehalis and travel 22 miles to the West Lewis County town of Pe Ell along state Route 6. There will be a festival and an overnight stay before riders journey back to Chehalis on Sunday. The cost ranges from $30 for an individual to $80 for a family, prices that include a t-shirt. Meal tickets are an extra $10. Visit the website to register or find additional information. Organizers are inviting artists, suppliers and manufacturers to display, demonstrate,and sell their products in a fun and creative way. The show is designed to open the imagination and inspire creativity for all levels of enthusiasts. Contact Sandra Wing, P.O. Box 305, Onalaska, or slwingdesigns@yahoo.com for more information. You’ll be hard-pressed to take in all the sights and sounds of this ever-transforming Mint City celebration. A staple in recent years has been a Civil War reenactment on Tune Road just outside Chehalis. There are often free flights for children at the nearby Chehalis-Centralia Airport. To top it off, attendees can watch RallyCross in action — and even give it a go themselves — in a field owned by the Port of Chehalis south of the town by the same name. 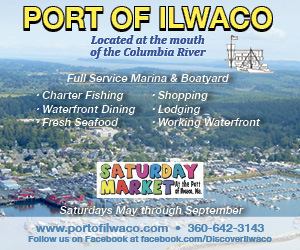 The event is organized by the Centralia-Chehalis Chamber of Commerce, which can be reached at (360) 748-8885. 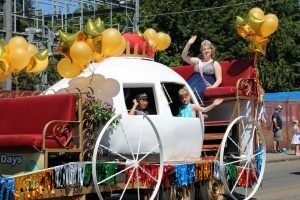 For more than a century one week during the summer has been reserved for the revelry and pageantry of the Southwest Washington Fair. The event represents many things for many people. It’s a carnival. It’s a venue for top entertainers. It’s a place where memories are formed that last many lifetimes. Above all, though, the Southwest Washington Fair is a showcase of all that’s wonderful about this beautiful swath of the Evergreen State. Wander the grounds and you’re likely to find something to satisfy all your senses. The midway sparkles and hums with the quintessential sounds and sights of American carnival life, the smell of elephant ears and other fairtime food favorites always carried by a light summer breeze. Barns burst with livestock and poultry raised by the youth of the greater Lewis County area, the living results of hard work and a way of life that has remained stubbornly similar to yesteryears. At the Southwest Washington Fair, you’ll find staples of Americana right alongside unique local offerings such as the annual Diaper Derby, an event that features dozens of chubby-cheeked, adorable crawlers all unknowingly working to win a grand prize for their parents. You’ll find local performers picking away at guitars or belting out popular tunes on stages tucked throughout the fairgrounds. Children will be amazed and entertained by Friendlyville, an area dedicated to the wonderment and smiles of the youngest attendees. Downtown Centralia is filled with lines of classic cars during this Hub City favorite sponsored by the Centralia-Chehalis Chamber of Commerce. The day includes vendors, live music and endless opportunities to gaze upon automotive wonders while popping in and out of the dozens of shops that make Downtown Centralia a shopper’s dream. The event is organized by the Centralia-Chehalis Chamber of Commerce, which can be reached at (360) 748-8885. View the website for details as the event approaches. Meet dozens of local artists and see their workplaces on the annual ARTrails studio tour. From traditional oil and canvas to modern photography and sculpture, you’ll be amazed at what our local artists create. Tours take place in September, with specific dates for this year still to be announced. The third annual Southwest Washington Writers Conference will be held at Centralia College. There is a terrific conference lined up, with award-winning memoirist Jennifer Lauck as keynoter. She is the author of the New York Times bestseller “Blackbird,” a memoir translated into 22 languages. She has written three additional memoirs, and will teach about Artistic Perseverance in Six Steps, the Essay in Eight Steps, and Drafts One and Two: Novel or Memoir. See the website for a full lineup of speakers and authors. Registration for the conference is required. The Apple Harvest is the culmination of a long summer and fall schedule of festivals across the greater Lewis County area, and it’s gaining in popularity. Thousands of people descend on the town each autumn to celebrate the diversity of Onalaska. As organizers say, “our festival started out small, but now we are struggling to contain the awesomeness!” Those who decide to take part will be treated to live entertainment, pie-eating contests, a parade, a community dinner, vendors, booths and so much more. Get into the Christmas spirit with a Chehalis tradition that is reaching its 67th year. Thousands of people turn out for the festivities, centered around a parade with Old Saint Nick that begins at 11 a.m. The seventh annual Lighted Tractor Parade is expected to bring large crowds for a unique parade highlighting the agricultural history of the area. The event has quickly become a favorite, as dozens of tractors, trucks, floats and virtually anything with wheels parade down Main Street, Tower Avenue and Pearl Street, all adorned with bright lights as Christmas music fills the night air. The Centralia Downtown Association is the brains behind this fast-growing extravaganza. Since 1982, the Southwest Washington Dance Center has enriched the lives of its participants and spectators alike. Take the chance to enjoy some of their work by making plans to attend the Spring Into Summer All School Dance. • June 25, 11 a.m. — Creative Dance & School Tour Production of “Where the Wild Things Are;” 2 p.m. and 7 p.m. upper level performance. The 21st annual Nutcracker Ballet is Dec. 16-18 at Corbet Theatre at the Centralia College campus. 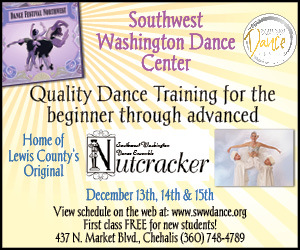 View the schedule on the web at www.swwdance.org.